Mommy has loads of inspiration for Berry! Love the striped tee, the trench, the cuffed jeans and ballet flats. Of course, how can this little girl not be chic? Her mom is Emmanuelle Alt after all. Again, that trench! So spring-y with a white tiered dress! I might just dress up like this too! 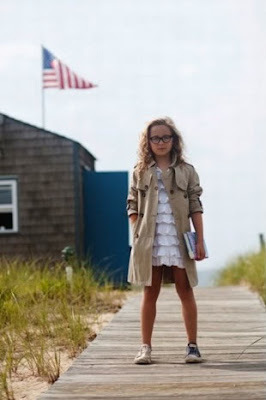 Thing is though, this kid has a nicer trench than I do. Must save up for a Burberry. Tough yet girly! What a cutie! And those sneakers kiddo, are way cool! Now, why didn't I get those suede sneakers from Generic Man at Gilt? Darn! This young man's color palette is gorge! White and gray! I actually saw some white denims at Baby Gap the other day, I don't know though if getting Berry a white pair would be wise. Berry has this habit of smearing her pureed food all over. Then again, I have back-up bottles of Grandma's Secret Spot Remover. Hahaha! Gosh darn it, kids these days dress up in the darndest cutest things! 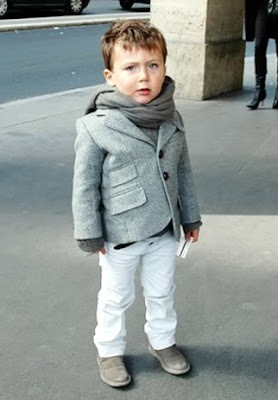 Love these photos, they definitely are chic kids, their outfits are sort of classic and timeless in the sense that people would look good in them no matter what age. The kids are soooo cute!!! And the clothes are adorable!!! Aww that little man will grow up as a fine man. Aren't they adorable?! Kids these days!